The Monster returns shedding the old skin and with new innards. It got a facelift done too! In a word, it’s more socially acceptable this time and doesn’t need you to dress up as a muscleman every time. There’s nothing more that you could write about the Monster. Years of user experiences have narrated it all; what you witnessed newly might have been earlier by someone else. The venerable Monster! Monster was kind of the Prospex of its times. Monster alike, the Prospex too matches up with the most demanding of environments and win. Only greater – and better! 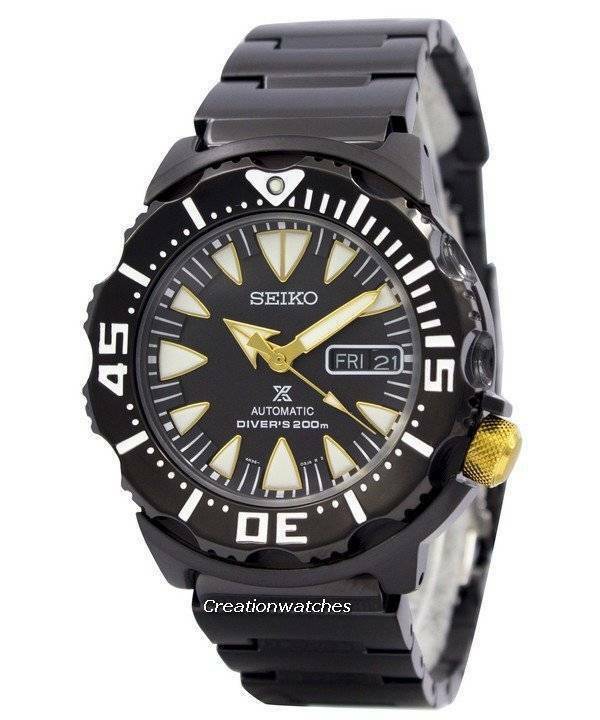 The Monster line of watches from Seiko is the least expensive of pro-grade watches running on quality automatic mechanical movements. It is fused with the Prospex traits to make it doubly strong against the rigors of regular harsh treatments. Surprisingly, all those good things didn’t hike the price much. The remodelled Prospex line debuted at the Baselworld 2014 to be offered globally. The Prospex Air-Dive Monster was the most interesting watch within the category. The black-n’-blue and black-‘n-gold versions were made available worldwide and today, only a few remain. The rest already found their respective owners. Those who claim that diver watches are all about being monstrous (in size) have not had seen these Air Diver-s before. At a 42.3 mm case diameter, it is just on the verge of getting monstrous. The dial has ample space to accommodate the signature, large lume-filled hour markers with ease and still leave space for the eyes to hover. The shark-tooth markers are prominent, both by itself and together with the large, highly-readable, luminous hour and minute hands. The central seconds hand; however, is only marked at and around its tip. Covering all is the Seiko proprietary Hardlex crystal. This has been hardened to be difficult to break; form cracks or shatter. The case is a solid chunk of steel with a screwed-in back. This aids in its overall WR capabilities. The 4 o’clock crown eliminates any chance of biting your wrist, always making to the sides. The knurled surface increases the grip incredibly. The markings too glow in the dark, making underwater reading bit easier than the rest. The SRP connotation mostly indicates the calibre 4R36 movements, making up the entire Seiko Sports 5 Automatic series. The 3Hz self-winder tucks in 24 jewels and holds 41-hours in its power reserve. You can stop the seconds-hand and also hand wound. The Prospex Air Diver 200 m Monster has similar specs as with the other Prospex watches, with the 4R36 making it suitable also for hard, field work. The black PVD treated stainless steel case is also one of the most interesting! 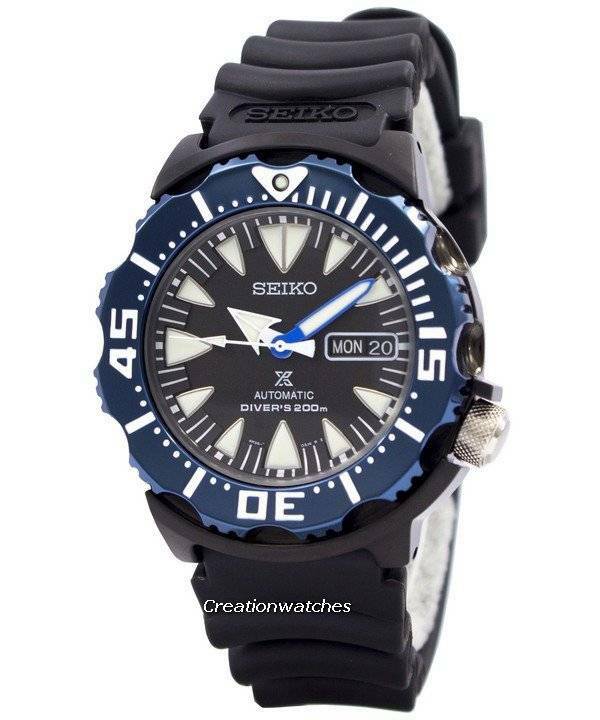 Previous post Newsletter : Seiko Monster 200m Divers Automatic Watches on Sale!